To help you run better meetings and events in 2019, we want to bring you the best experience with Slido. Thanks to your feedback, we’ve worked on some exciting new features and improvements in the last few months. Here’s a quick recap of the most important product news and updates. You will now find it easier to collect and curate the top ideas with your team, using our new feature, Ideas. Capture people’s thoughts on a certain topic, discover the most popular ones by voting, and display them on a screen. You can download and share the collected data instantly. For inspiration, here are the six most popular ways to use Ideas. Organizing a conference or all-hands meeting requires teamwork. Invite your colleagues or collaborators to access your Slido event and help you manage Questions, Polls and Ideas on the day. Learn more about the feature including the six most common use case examples here. Why not turn your next meeting or training into a quiz-like experience? You can now highlight the right answer when using multiple-choice polls, both in the Present view and on the participants’ devices. It’s also possible to download the results to see how each person voted. Learn how to set it up here. For more inspiration, check out these three examples of how you can use Correct Answer. There’s no need to switch between your slides and Slido anymore. 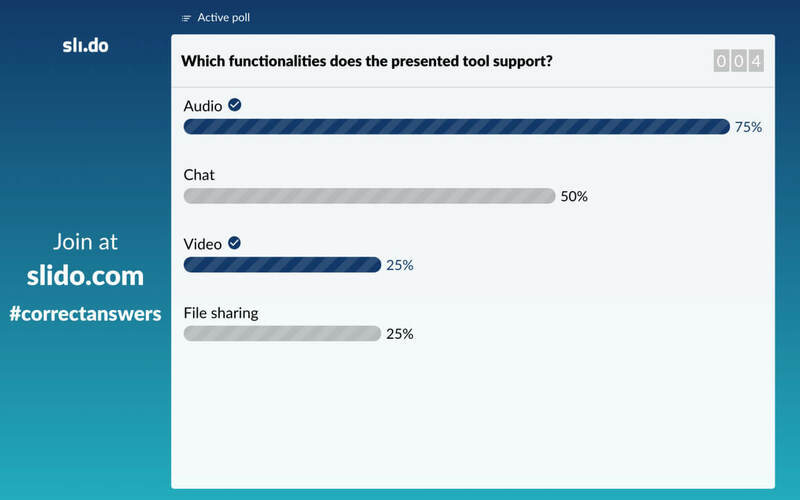 As a presenter, you can now add Polls and Questions directly to your PowerPoint presentation. Use the Slido PowerPoint add-in (currently in BETA) with your smartphone as a remote control to activate polls and display questions. Learn how to set it up here. If you use Google Slides, you can sign up for early access to Slido for Google Slides in your event settings under Integrations or here. Add a description to any poll in the participant view: Each poll type now has a field for adding a description text, which will be visible only on the participants’ devices. Display results in vote numbers rather than percentages: In the Event settings, you can choose how you want the poll results displayed – in the number of votes or percentages. This will be reflected in poll exports, too. Choose a voting identity to increase privacy: Participants can choose whether they vote in polls anonymously or with their name, even if the name was previously entered when joining an event, sending a question, using SSO authentication or in the profile menu. We’ve integrated Product News directly into the Admin to bring you the most important product updates faster. In your Profile menu, click on “Product news” and a side panel will roll out with a list of key announcements. You can check out the links, share your feedback and revisit them anytime. We know that setting up a new tool for the first time can be daunting. 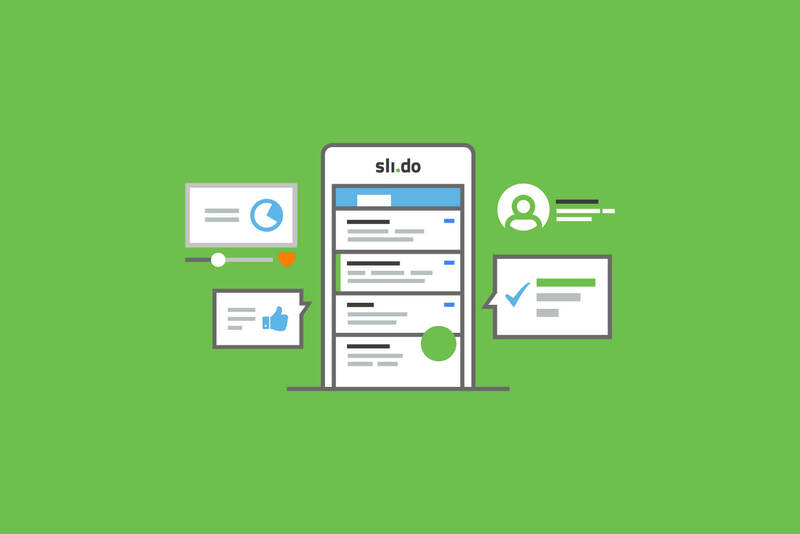 To guide you through the journey and make it as smooth as possible, we’ve launched the new Slido Academy, which you can find directly in your Admin. It includes a series of short tutorials that will answer some of your most frequent questions about how to set up and use Slido. In addition to the tutorial videos, we regularly bring you practical tips, how-to guides and creative ideas for running better meetings and events on the Slido Blog. We recently redesigned it to make it faster and easier to navigate. Would you like to receive regular inspiration directly to your inbox? Visit our blog to sign up for our monthly newsletter. As always, we love to hear your feedback. Please keep sending your ideas for improvement and new feature requests to feedback@slido.com or on Twitter @slidoapp.